Marvel's patriotic superhero is already suiting up for both high-definition formats in late October! As previously reported, Paramount is preparing 'Captain America: The First Avenger' Blu-ray/DVD/Digital Copy combo pack and 'Captain America: The First Avenger - 3D' Blu-ray 3D/Blu-ray/DVD combo pack for a fall release, and now that date has been officially confirmed for October 25. The action-packed adventure stars Chris Evans as Steve Rogers, the scrawny weakling turned super-soldier and future leader of The Avengers. The film co-stars Hugo Weaving as Red Skull and Samuel L. Jackson reprises his role as Nick Fury. The releases will feature 1080p video, a DTS-HD Master Audio 7.1 soundtrack, and supplements will include: Commentary by director Joe Johnston, director of photography Shelly Johnson and editor Jeff Ford; Deleted scenes with optional commentary; the Marvel One-Shot: A Funny Thing Happened on the Way to Thor's Hammer; Outfitting a Hero; Howling Commandos; Heightened Technology; The Transformation; Behind the Skull; Captain America Origins; The Assembly Begins; and trailers. Suggested list price for the Blu-ray is set at $42.99 and the Blu-ray 3D is $54.99. 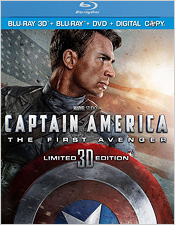 You can find the latest specs for 'Captain America: The First Avenger' and 'Captain America: The First Avenger - 3D' linked from our Blu-ray Release Schedule, where they're both indexed under October 25.